We asked ourselves the same exact question, but try as we might, we couldn’t come up with a reason not to make one. 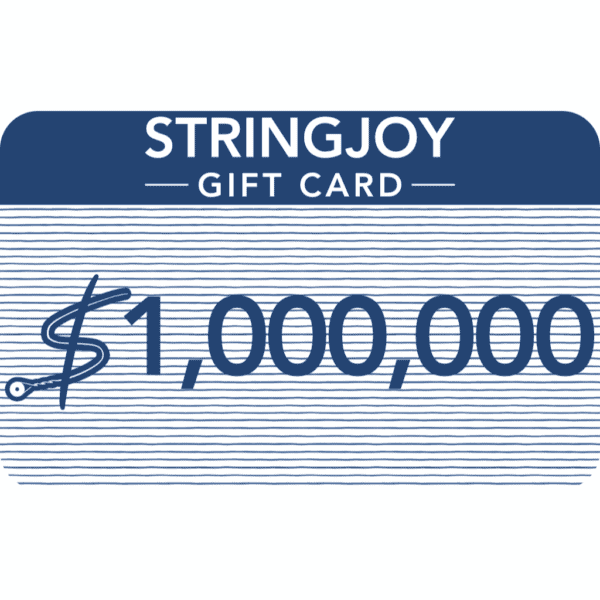 We figured in the off chance that someone somewhere wanted to buy a million dollar gift card, why should we stand in their way? If somebody wants to get a million dollars worth of guitar strings, then by golly they should be able to! Just to put this all into perspective, $1,000,000 worth of guitar strings would be 84,000 sets. That means if you changed your strings every single day, it would take you until March of 2247 to go through them all. That’s 230 years. I don’t even know if guitars will still use strings in the year 2247, or if there will just be lasers going up and down the neck of your guitar (which honestly sounds pretty rad to me). This is all assuming our robot overlords allow us to play guitars in 230 years. But if you want your great-grandchildren to enjoy the good ol’ days of when music was made by plucking some metal wires, then you might want to go ahead and stock up. Now, if you were to purchase 84,000 sets, place each string end to end, and tie them together, you could make a rope, complete with a 30-ish mile wide lasso, to wrangle the International Space Station back to Earth. But if you do that and get in trouble with NASA (which you will), keep us out of it. Before you click that big blue button though, just make sure you have enough room to store all those strings, because you’re gonna need about two and half football fields.